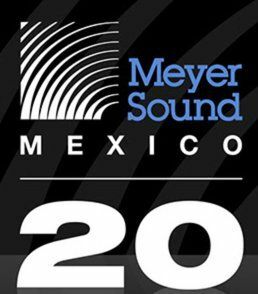 Meyer Sound co-founders John and Helen Meyer will celebrate two anniversaries - the 50th of their first meeting and the 20th of Meyer Sound Mexico - when they attend sound:check Xpo in Mexico City. In addition to the dual commemorations, Meyer Sound's presence at the show will include the Western Hemisphere introduction to the LINA very compact linear line array system as well as a keynote presentation by John Meyer at the co-located AES Mexico Annual Conference. "John and I are thrilled to come to Mexico and build on the many close friendships we've established over the years," said Helen Meyer, Executive Vice President. "Mexico not only has been an important customer over the years, but also has provided key leaders for our worldwide sales, product development and education teams." The Meyers' visit to Mexico City continues a "Sonic Love Story" theme, introduced in Amsterdam during the ISE show, that commemorates the couple's first meeting in 1967 - the San Francisco Bay Area's iconic "Summer of Love." The Meyers will be meeting informally with customers on Monday and Tuesday, April 24 and 25 in the Huichol demo room. This year also marks two decades since Scott Gledhill, now Meyer Sound's Director of International Sales, established Meyer Sound Mexico to provide a direct connection between the parent company and the rapidly growing Mexican market. The new subsidiary gained a reputation for offering the highest level of service, technical support and customer education of any pro audio supplier in Mexico. Demonstrating its continuing commitment, Meyer Sound has been a prominent exhibitor at every sound:check Xpo since it was launched 15 years ago. "Meyer Sound remains committed to continuing our long-standing close relationships with all our customers in Mexico and Latin America," said Antonio Zacarias, Vice President of Sales and Customer Engagement. "We all share a common commitment to technical excellence and educating young people for high-paying jobs here in Mexico." Making its debut in the Americas will be Meyer Sound's new LINA very compact linear line array system, the smallest and lightest member of the expanding LEO Family. LINA brings the inherent linearity and exemplary power-to-weight ratio of the LEO Family to a wide range of applications where discreet appearance, flexible rigging options and minimal hang weight are critical. The complementary 750-LFC low-frequency control unit extends response to 36 Hz while providing options for pole-mount, flown and ground stacked combined systems. Additionally, Meyer Sound's distributor for Mexico, Showco, will display an extensive range of products in Olmeca II, including a complete LEOPARD compact linear line array system with 900-LFC low-frequency control units, LEO line array loudspeakers and LYON™ linear line array loudspeakers, MJF-208 and 210 stage monitors, and a GALAXY networking platform.